Forged in the heart of a star, only the mightiest of paladins can wield the sacred weapon of the sun god. Prove once and for all that you are the fiercest warrior of holy justice by entering battle with the LARP Spear of Light! This epic LARP spear is made from a sturdy, closed-cell foam that encases a fiberglass core and is coated in latex, making it more resistant to damage through use. A Kevlar tip at the end of this blade adds extra safety to its design. 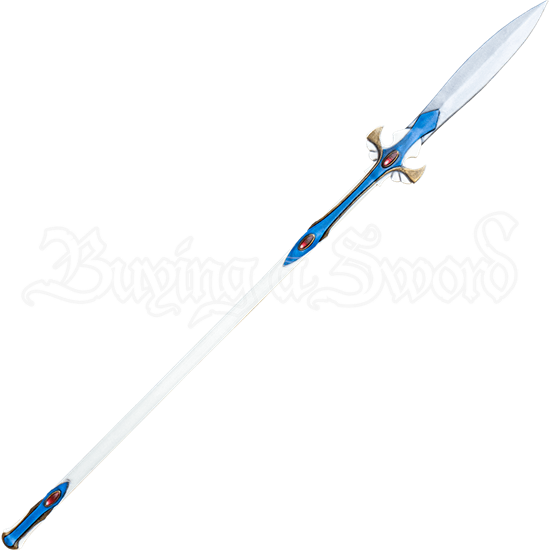 Its white blade and haft are accented by blue and gold with red, gem-like inserts. A winged crossguard sprouts from just below the blade, adding to the angelic aesthetic of the weapon. Wield this incredible spear in battle and enhance the look of your LARP character! The LARP Spear of Light has an overall length of 74.8 inches. Please be aware that this measurement can vary slightly, as it is a hand-made item.